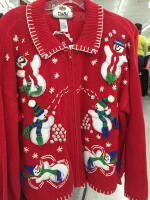 Ugly Holiday Sweaters: An Eco-friendly Tradition - Planet Aid, Inc. The holidays are here so chances are that you’ve been invited to an ugly sweater party (or two). For the last several years these parties have become all the rage of the holiday season and, thankfully, it doesn’t look like they’re going away anytime soon. Here at Planet Aid we’re committed to environmentally conscious living so we love ugly holiday sweater parties! When done right, they present a great opportunity to reuse clothing that would otherwise go to waste and likely end up in a landfill. Aside from just being fun, ugly holiday sweaters are great because they involve reducing, reusing, and recycling! You reduce consumption by wearing something old instead of buying something new, you wear them again and again, and they can be made of recycled materials from around the house. If you end up deciding not to save your ugly sweater for next year, make sure you continue the eco-cycle by dropping into a yellow bin near you for recycling! 1) The first way to go about your sweater search is to hunt through the racks at your local thrift store or vintage shop. People often give away clothing because it is outdated and no longer in style. These stores are bound to have something “ugly” from past generations that you can now reuse in the 21st century! You’ll get to buy yourself a “new” sweater without contributing to the expensive and environmentally harmful production process of clothing manufacturing. It’s a win-win! 2) Another option is to ask an older relative or friend if they happen to have any old holiday sweaters from the ‘80s or ‘90s tucked away in a closet or attic somewhere. You may be able to borrow a sweater that’s ready to go! Tread lightly with this option, since your mom or grandma might be offended that you think their old fashions are “ugly” now. But, if you can get away with it, you’ll bring new life to a vintage piece. 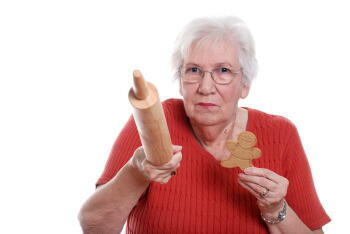 If you keep passing it down, it could even become a family heirloom! 3) The last and, perhaps, best option is to make your own ugly sweater! It’s an easy way to recycle items from around the house and you will end up with a one-of-a-kind work of art! To make your ugly sweater, find a sweater from your wardrobe that you no longer want. If you don’t have one, ask friends or family or buy a used one from the thrift store. It can be solid or patterned—whatever you have will work! Then go around the house to find craft supplies or knick-knacks that you can add to your sweater to make it look extra tacky. A great place to look is among your stash of old holiday decorations. 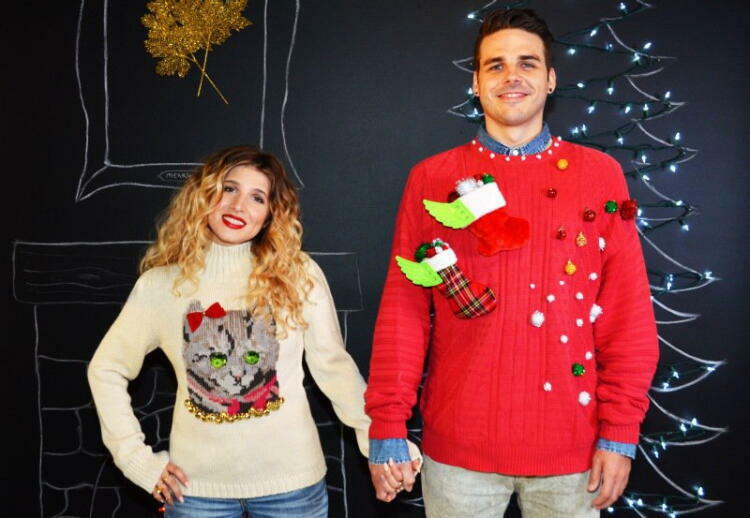 String lights, gift bows, garland, ornaments—it all looks tacky when you put it on a sweater. Once you have your supplies in hand, you can use hot glue or needle and thread to arrange and attach your decorations in the ugliest way possible. Just get creative. There’s literally no way to mess this up! For more inspiration and instructions, check out spitupisthenewblack.com and thecardswedrew.com.